Want to win my whole store? Hello Everyone – it’s my turn for Manic Monday at Moo Two Designs! 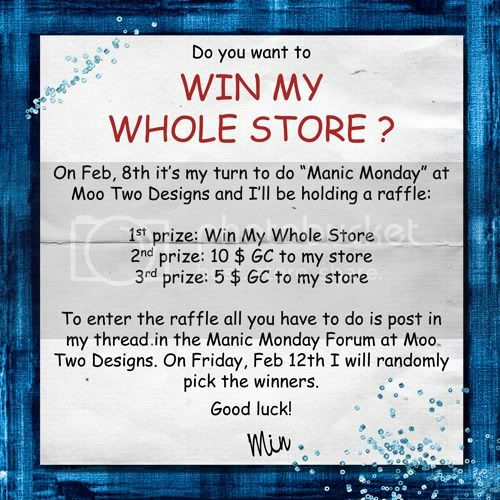 If you want to win my whole store or one of the GCs, just post at the Moo Two Designs Manic Monday Forum in my thread for this week! There’s also a great freebie waiting for you – go find out what it is, LOL! Anyone who reads please check out my blog at byutatortotdesigns.blogspot.com! You can recieve free blog templates, blinkies and headers! I also include free customizable designs.